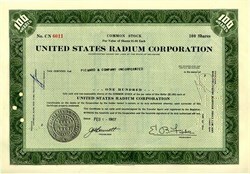 Pack of 100 Certificates - United States Radium Company (Famous Radium Girls Lawsuit and Play) - Price includes shipping cost in U.S.
Home > Certificate Quantities for Educators / Business Promotions > Pack of 100 Certificates - United States Radium Company (Famous Radium Girls Lawsuit and Play) - Price includes shipping cost in U.S. Beautifully engraved certificates from the United States Radium Company issued in the 1960's. This historic document was printed by the Hasbrouck, Thistle & Co. new York and has an ornate border around it with the company's name on top. This item has the printed signatures of the Company’s President, E. Boudinot Fisher and Treasurer, Joshua H. Bennett and is over 50 years old. 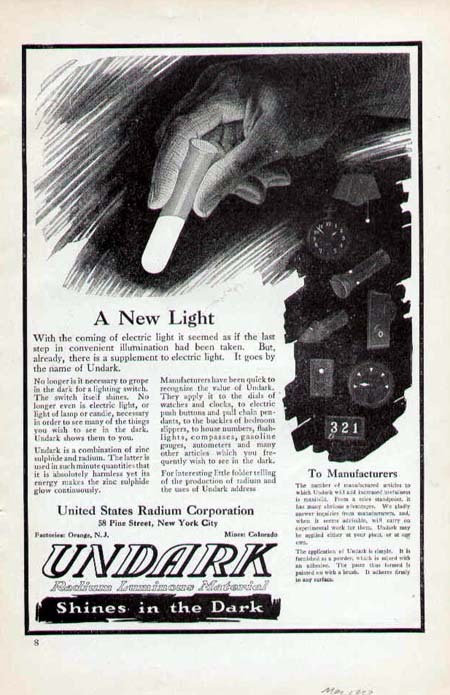 In the US, the first company to produce radioluminescent paint was the Radium Luminous Material Corporation in Newark New Jersey (Changed their name to United States Radium Company in 1922). It was founded in 1914 by Sabin von Sochocky and George Willis, both physicians. Their operations expanded tremendously when the United States entered World War I, and in 1917 they moved from Newark to Orange, New Jersey. They also got into the business of mining and producing radium. In 1921, they changed their name to the U.S. Radium Corporation.